Copyright © 2018 MRC Laboratory of Molecular Biology. 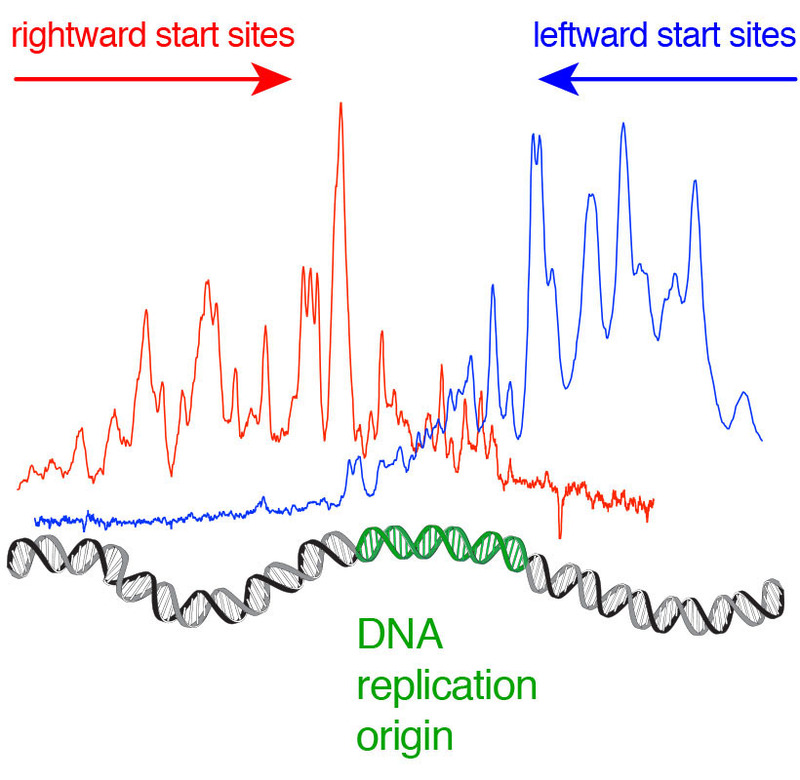 Start sites for leading-strand DNA replication have been mapped relative to a eukaryotic DNA replication origin. This work reveals that leading-strand synthesis is initiated from lagging-strand primers. We each replicate billions of metres of DNA every hour in our dividing cells and it is important that this DNA is replicated accurately. This requires a complex set of machinery called the replisome to unwind the paired strands of DNA allowing different polymerase enzymes to produce new copies. DNA replication is further complicated by the antiparallel structure of DNA: the two strands run in opposite directions alongside one another, and DNA polymerases can only function in one direction. This means that one new strand can be synthesised continuously and is known as the leading strand, while the other strand, known as the lagging strand, is made in short fragments that are subsequently joined together. A new study from Joseph Yeeles’ group in the LMB’s PNAC Division has shown the first mechanistic description of how replication of leading-strand DNA is initiated. 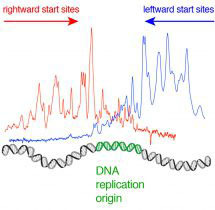 DNA replication starts at specific sites in the genome called origins. In most lifeforms, including our own cells and yeast cells (the model organism used in the Yeeles lab), this process is bidirectional: starting at origins, two replisomes are assembled and simultaneously move away from the origin in opposite directions, one to the left and the other to the right. This results in a leading and lagging strand being formed on either side of the origin. Importantly, the leading strand on one side of the origin, and the lagging strand on the other, are produced using the same parental DNA strand as the template. By assembling the yeast DNA replication machinery at a replication origin in a test tube, starting from individual purified components, Valentina Aria, from Joseph Yeeles’ group, was able to investigate the requirements for initiation of bidirectional leading-strand synthesis and map the start sites for replication. Interestingly, she found that the synthesis of leading strands to the left of the origin actually begins on the right side of the origin and leading strands on the right side of the origin are started to the left. Illustration showing how leading-strand replication is established at eukaryotic DNA replication origins. 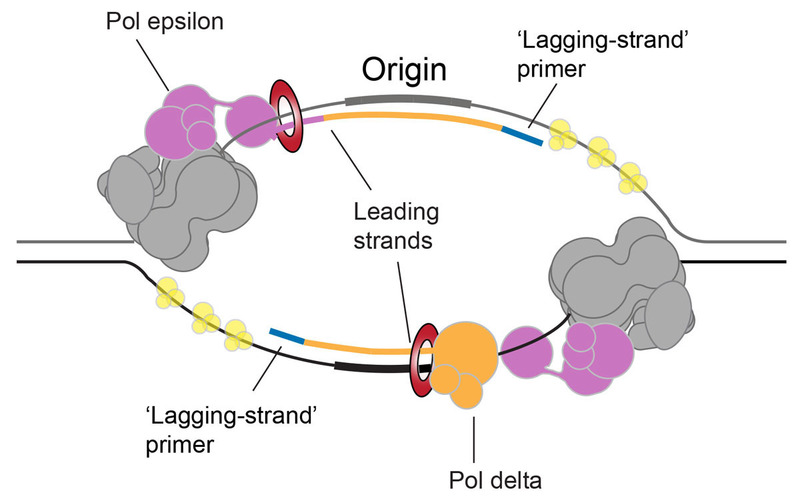 Mechanistically, the researchers showed that the first section of lagging strand to be made on the left side of the origin is extended back across the origin by DNA polymerase delta, the DNA polymerase that performs lagging-strand DNA synthesis. Eventually, DNA polymerase delta catches up with the replisome moving to the right of the origin and hands DNA synthesis over to another polymerase, DNA polymerase epsilon. Since DNA polymerase epsilon travels together with the replisome, this allows the new strand to be replicated not as a discontinuous lagging strand, but rather as a continuous leading strand. The leftward leading strand is simultaneously established from the first section of lagging-strand DNA on the right of the origin using the same pathway. Identification of this mechanism is an important advance in our understanding of how DNA is replicated inside our cells. The work was funded by the MRC.